It’s great to be back at InspyRomance! I took some time away as I was in a “hectic season” of life (can anyone relate?) but now I have time again to devote to this group. The past several months have been good for me, as I’ve been easing back into the writing world again. I’ll bet many of you have heard about a six-author project I’m involved in—a foodie-based continuity series set in Arcadia Valley, Idaho. I’ve been working with Valerie Comer, Elizabeth Maddrey, Mary Jane Hathaway, Lee Tobin McClain, and Danica Favorite to bring Arcadia Valley to life, and it has been such a fun project to work on. Romance Grows in Arcadia Valley, a collection of six novellas, releases on Tuesday, January 10. Each novella is the kickoff to its own series. Next month, the first full-length Arcadia Valley novel releases—and there will be one each month for eighteen months. That’s six different series with three books each, all set in Arcadia Valley. How fun is that? My novella, A Romance Rekindled, kicks off the Homegrown Love series. My series focuses on the Jennings sisters, along with their cousin, Kate, as they navigate life and love against the backdrop of the Arcadia Valley Farmers Market. Kate Groves finds herself back in Arcadia Valley at the request of her dying father. Not only does he want her to agree to remain in her hometown to oversee the renovation of her childhood home, he also wants her to take over as manager of the Arcadia Valley Farmers Market. Kate has no desire to stay in a town filled with ghosts of mistakes past. And when she learns that part of her dad’s plan is for her to work side-by-side with her ex-fiancé, she’s less than thrilled. No matter how charming or handsome Drew is, Kate continually reminds herself that he broke her heart — and she doesn’t intend to allow that to happen again. I’m very excited for you to meet Kate and Drew, along with the great cast of characters who live in Arcadia Valley. Read an excerpt from A Romance Rekindled here. The first novel in the Homegrown Love series, On Board for Romance, releases in July. That sounds like an interesting story. Thanks for sharing. As for your question, that’s pretty easy: I’m most looking forward to my baby’s arrival. My due date is 6 weeks. 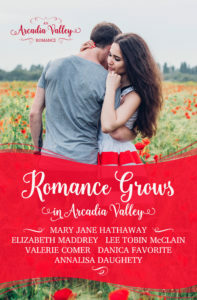 Looking forward to the introduction of authors and series in Romance Grows in Arcadia Valley. My copy is preordered. An interesting new concept. Always amazed at the ingenuity and talent of authors, who wear many different hats. I see a common thread in today’s give away question. Our family is anxiously awaiting the arrival of Seeley Rose mid January. This will be son number two first child, our fourth grandchild and second granddaughter. Our family has been predominately male, so I am tickled pink. Happy New Year and best wishes on your new writing adventure. Nice one, Renate! “Tickled PINK indeed!” We’re expecting our fourth granddaughter in early Feb. No boys. I think we’re all about pink power! Great to see you again, Annalisa! I enjoyed the blurb for A Romance Rekindled and I look forward to reading it…congratulations! I’m excited about this group of series! I’m most looking forward to a family vacation in February as well. My kids will finally get the chance to meet my grandma! Annalisa, I love these types of books. Can’t wait to read them. Congrats on the release. We’re looking forward to finishing updates to our house, a quick sell,and moving near our children and grand children. We’re currently in northern Virginia and are moving to Bowling Green, Kentucky. That sounds like a great year, Diana! Now that my husband and I are both retired I’m looking forward to spending more time camping. Babies are a common theme in the comments! I’m looking forward to GrandGirl #4’s arrival in a few weeks. I’ve also had such a terrific time working with Annalisa and the others on the Arcadia Valley Romances this past year, that I can’t wait for the novels to begin rolling out in February! It will be an exciting year for the project. Thanks, Valerie! I’m really enjoying working on the Arcadia Valley project! And you are right–that’s going to make it a fun year. My great-nephew is graduating from high school in June, so we’re looking forward to that! That sounds like fun, Margaret! We have a couple of graduations to look forward to this year, too. Welcome back. Thanks for sharing. Thanks, Merrillee! It’s great to be back! I’m glad you have been able to continue writing. I look forward to all the books I’m going to read in 2017. Just can’t get enough of good books. Good Morning!! I enjoy books with stories by different authors! This sounds like a great read! Thanks, Karen! I hope you enjoy the series! The Series sounds like it will be a good one. What I am looking forward to in 2017 is a visit from my cousin I haven’t seen in at least 2 years. Thanks, Brenda! Hope you have a great visit with your cousin! Sounds like a fun collection, what a great idea to introduce some new series to us. Thanks, Amy! And congrats on getting your story published! That’s so exciting! Hi! Happy New Year to you and your family! 2016 was a sad one for me, so this year all I’d like is peace in my immediate family! Looking forward to more free time to spend with my family.This book and series sounds great.